The Teramo's buckle pieces are clearly thinner than most. But as the article states, "Consumer Reports' chinstrap test is modeled after, but not identical to, the CPSC's standard." 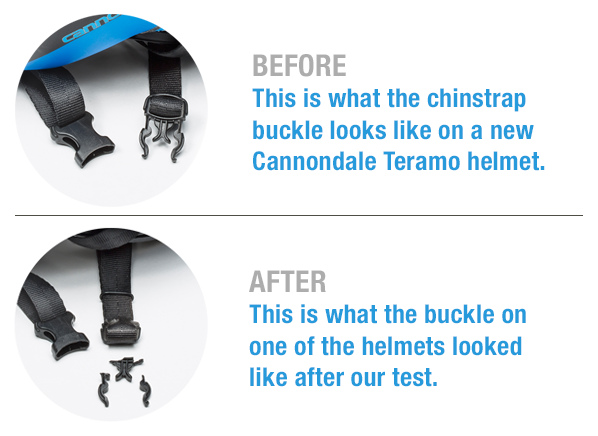 Cannondale has responded to Consumer Reports and in a letter to dealers that the buckles meet CPSC and have had no failure issues. BHSI's Randy Swart was quoted in the article making a general statement about buckles. He had not been informed by the CU reporter that the quote was to be used in an article about a buckle failure, but as a general statement about buckle importance it is a good quote. CU doesn't like to discuss their findings before an article is published. If asked, we would have said that an article with results based on a test other than the CPSC test is misleading at best. We have no idea whether or not the buckles meet the CPSC test, and apparently Consumer Reports does not know that either. If they do meet CPSC they are certainly strong enough. The CPSC retention test is a severe one, and sometimes thought to result in a too-strong buckle and strap. Cannondale says the buckles meet CPSC. We are disappointed in Consumer Reports for using a non-standard test and announcing the failure in a spectacular way. That does not seem fair to Cannondale. They should have tested the buckles to the CPSC standard before announcing to the world that they fail. This is not the first time CU's lab has broken buckles. You can find more in our reviews and other materials related to their articles in 1997 and 2006. We are still unaware of any field reports of injury to riders in any of the models whose buckles they have broken in the past, and there are no reports of buckles breaking in the field on the Teramo. Despite the Consumer Reports recommendation, we would not junk a Teramo unless there is confirmation from CPSC that the buckles do not meet the CPSC standard. This page was revised or reformatted on: February 2, 2019.